Better late than never, the Rangers appear on the verge of making a significant off-season move. Not surprisingly, it’s to acquire a healthy pitcher. 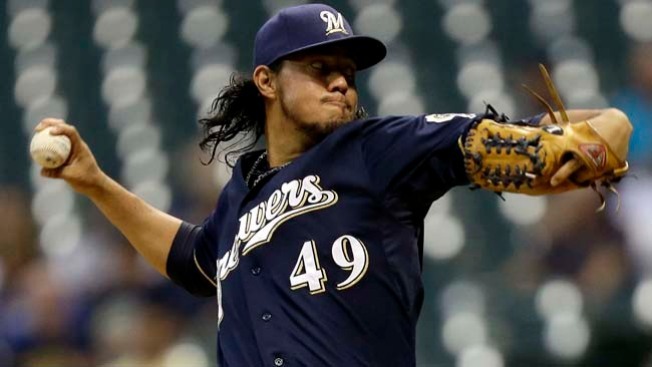 According to FoxSports.com, the team that used a whopping 15 pitchers during last season’s 95-loss disaster is close trading for Milwaukee Brewers’ right-hander Yovani Gallardo. Gallardo, who turns 29 next month, makes sense on several levels. He’s a local guy who went to Fort Worth’s Trimble Tech High School, an innings-eater who has made 30+ starts for six consecutive seasons and a free agent after next season. Rangers’ general manager Jon Daniels covets players in their final contract year, as their motivation to perform is usually at its peak and the team’s flexibility with the asset is also maximized. But first and foremost, Gallardo would be a reliable arm on a staff that missed Derek Holland for most of last season and this year will be waiting on returns from surgery by Matt Harrison and Martin Perez. Gallardo wasn’t great last season, going 0-5 in his last seven starts as the Brewers missed the playoffs. But he’s a ground-ball pitcher with an 89-64 record and 3.69 ERA over eight years in Milwaukee. The Rangers know what they’re getting in Gallardo, as Mike Maddux was his pitching coach for two years in Milwaukee and new manager Jeff Banister opposed him regularly while with the Pirates. Gallardo won't challenge Yu Darvish as this staff's ace and he won't win 20 games, but is the perfect kind of insurance policy that the Rangers' staff desperately needs.